Voucher codes and coupons for use when buying top quality watches and jewellery at paul-hewitt.com. PAUL HEWITT sell a range of jewellery, timepieces and accessories for both men and women with a unique nautical theme. All products come complete with a 24 month guarantee, 14 day returns, secure online payment and free delivery available. The products are of timeless and minimalistic design in precious metals such as gold, rose gold and silver. This is definitely jewellery with a difference at Paul Hewitt. When you look through a typical online jewellery store you tend to see the same things over and over even though they may be subtle differences between them all. Here everything is really unique and mainly has an appealing nautical theme overall. 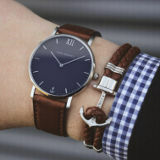 The watch selection is certainly not following the latest timepiece crowd and is wholly sticking with the traditional quality look with bright white and pure looking faces with nice looking straps. Most of the bracelets are of a rope design with anchor catch in a variety of designs. The gold and silver style metal bracelets and necklaces again have an anchor catch or pendant. One unique thing that you very rarely see is the quality policy outlining the commitment to exacting quality standards, a great selling point. Different strap lengths and case sizes are available with watch purchases so you’ll never have to alter a strap which is handy for gifts. The case, strap and dial colours can also be personalised to your taste. Ido like the side popup with the basket and price details when you continue to order with the approximate shipping times. To enter a voucher code or coupon you have to edit the basket details, If you go straight to checkout you will miss out on the discount opportunity, just check the ‘I have a voucher’ option box at the basket. There’s no need to create an account if you don’t want too with guest checkout facilities, but it is always a prudent idea to sign up for the newsletter if you like to keep up to date with the latest special offers and product launches. Shipping is free on orders subject to a minimum order value normally within 1-2 working days from despatch. All products come complete with a 24 month guarantee and a 14 day no quibble returns policy. Payment can be made using most of the major credit and debit cards, by bank transfer of using PayPal.